Olbas Pastilles are maximum strength cough suppressant lozenges that have powerful vapors. They provide instant, cool soothing relief for sore throat and mouth pain and help you fight coughs. Powerful, cooling vapors help to make your nasal passages feel clearer, too! These extra-strong lozenges help you fight coughs due to minor throat and bronchial irritation that often occurs when you have a cold, or when you inhale an irritant, like smoke. They also have a natural anesthetic action that provides instant, cool, soothing relief for sore throats and mouth pain. Features a natural formula compounded from soothing herbs and chlorophyll, which gives Olbas Pastilles their luscious green color - and helps freshen your breath, too! These long lasting lozenges are as powerful as they are soothing. The strength and effectiveness of these cough drops is extraordinary! 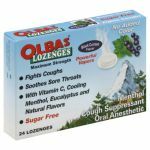 Olbas Lozenges give you maximum strength cough suppressant action that also makes your nasal passages feel clearer. These tasty lozenges help you fight coughs due to minor throat and bronchial irritation that often occurs when you have a cold, or when you inhale an irritant, like smoke. They also have a natural anesthetic action that provides instant, cool, soothing relief for sore throat. Take one and breathe in deeply... you will notice almost immediately how the powerful, cooling vapors give you an intense feeling of increased airflow in your lungs and sinuses! Features pleasant tasting Black Currant flavor, combined with soothing Menthol, Eucalyptus and Vitamin C - a key immune system nutrient and a potent free-radical fighter. 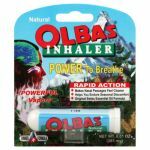 Natural Olbas vapors provide a pleasant, refreshing, and cooling sensation to your nasal passages. Especially beneficial during times of seasonal discomfort, low humidity and other unwelcome nasal encounters. Fast-acting, penetrating vapors provide an immediate, fresh, clean feeling in the nose, sinuses and lungs. 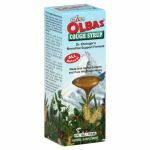 Olbas Cough Syrup contains a small amount of Olbas Oil along with these carefully selected Herbal Extracts that are blended to strengthen healthy lung function and support the mucous membranes in the respiratory tract, promoting clear and healthy bronchial passages: Thyme has a variety of natural flavonoids that increase its antioxidant capacity, helping to support immune system function. Licorice contains glycyrrhizin, a glycoside that balances the normal production of mucus in the respiratory tract, maintaining healthy lung function. Plaintain contains natural flavonoids that soothe and cleanse the bronchial area, supporting healthy breathing. Horse Chestnut contains a saponin known as aescin, which promotes normal circulation and healthy bronchial activity. Pine is recognized to be one of the most potent antioxidants- substances that support the immune system.